Please consult this sizeguide to determine your size. On the left the sizinglabel from Collectif, the other columns our sizing indications with the corresponding bodymeasurements. The elastic sleeves can pinch a fuller upper arm. 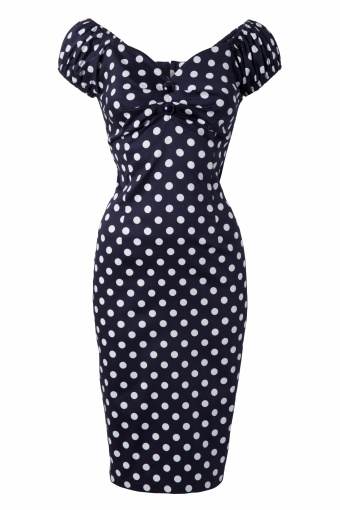 The 50s Dolores dress navy white polka dot from Collectif. 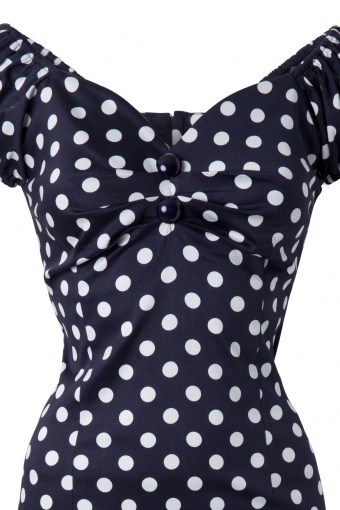 This is a fun puffed sleeve stretch cotton blue wiggle dress with white polka dots all over. This dress is a bestseller for years and has been revamped now! The fitting has improved: the bust is sweetheart shaped and fits perfectly around every bustsize. The waist is more fitted for a perfect hourglass shaped figure. It is made from a soft cotton with a stretch, so this dress hugs all your curves and is super cute and sassy with a small pucker in the bust and a back zipper. Back slit creates ease of movement.